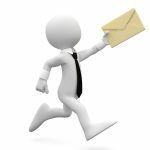 We can provide you with a competitive block paving quote from our database of authorised block paving installation companies around the UK. Whether you are looking to renew your driveway, patio, footpath or playground, this service is completely FREE. They say that you never get a second chance to make a first impression and your new block paving driveway will make a good first impression for visitors to your home. The wide choice of colours, texture, shapes and sizes of modern block paving means that there is something to suit every home. 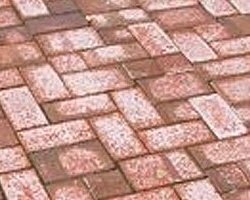 Whether you need a new block paving footpath or a block paving driveway to accommodate your cars, we can provide you with a competitive block paving quote to suit your budget. Standard Block Paving Patterns include Basketweave, Herringbone and Stretcher Bond and often the shape of your driveway will determine which pattern suits best. For example, straight driveways may look better with a basketweave or stretcher bond pattern whilst shaped areas may better suit one of the herringbone styles. You can create a distinctive block paving driveway by using two different types of block, or more than one colour, often with a brick border or feature inlay pattern. The shape and size of your new driveway will obviously be limited by how much space you have but you need to take account of any additional parking space you may require, planting areas you would like to keep and whether steps or footpaths are required. You also need to allow for rain water run-off, drainage requirements and kerbs or edging. 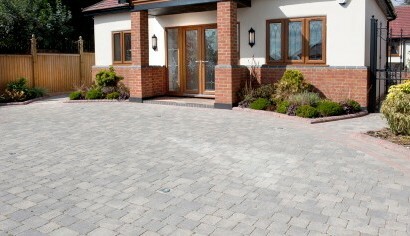 Once you have resolved the practical issues you can start to consider the shape of the driveway, curved or straight? and the type, size and colours of the blocks. 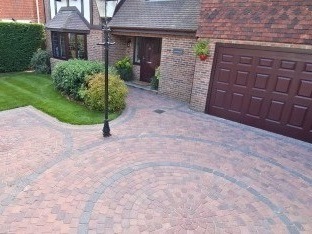 Your block paving quote should list in detail all of the work which is to be carried out and perhaps that which is not. Also, you should agree the layout and dimensions of your new driveway when your installer marks it out on the ground. Depending on ground conditions, you will need to excavate the area to a depth of between 180 mm and 250 mm to allow for a deep enough stone sub-base. It’s not such a bad idea to let a professional deal with the excavation using a mechanical digger and remove the waste on a truck. Bearing in mind that the spoil doubles in size when excavated, a 60 square metre driveway can produce up to 30 cubic metres of waste, which would fill quite a few skips. Your block paving quote should explain in detail how the sub-base will be constructed and how underground pipes and cables will be dealt with. You need to install effective drainage systems on and under your new driveway; not only to avoid standing water but also to satisfy regulations with regard to SUDS (Sustainable Urban Drainage Systems) legislation. This requires that surface rain water falling on your driveway must be dealt with on your land and not be allowed to run-off onto the public highway. Your block paving quote should detail how SUDS legislation will be satisfied because ultimately it is your responsibility not that of your driveway installer. Stone Sub-base: The stone sub-base for your driveway should be of sufficient depth and compaction to support the driveway and cars which are intend to use it. Taking into account the ground conditions, this generally means compacting Type 1 MOT in 50 mm layers to a depth of at least 100 mm and even 150 mm if required to form a level and solid base. 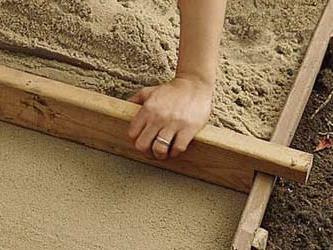 Sand Screed: A 30 mm to 50 mm screed of damp sand should be raked level and compacted over the stone sub-base. This screed should have a further thin layer of fairly dry sand levelled over it for the blocks to sit on. 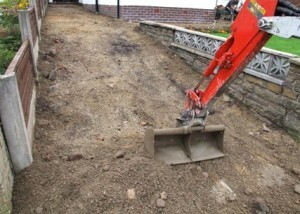 To minimise movement of the blocks once they have been laid, you should start at the bottom of a slope and work upwards. You will need to cut some of the blocks to size next to the edges of most driveways but this should be done after all of the full blocks have been installed. If you are using a multi blend of block paving it is wise to mix the blocks from different pallets to make sure that you finish with an even spread of the various colours across your new driveway. It is important that once all of the blocks are in place and any debris has been swept from the driveway surface, that kiln dried sand is brushed into all of the joints between individual blocks. The blocks should then be compacted with a vibrating plate before any excess sand is removed. At this stage some block paving installers may suggest sealing the blocks with urethane sealant. This will enhance the colour of the blocks, help repel oil and protect the surface of the blocks from spillages. 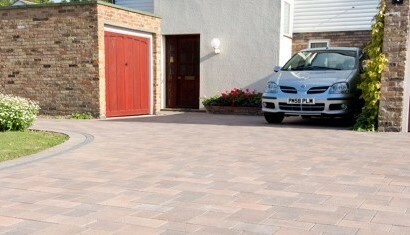 You should check whether treating your new driveway with a sealant is included in your block paving quote. All types of paving have their advantages and disadvantages but more often than not, if good quality products are installed well, most of the disadvantages can be eliminated. 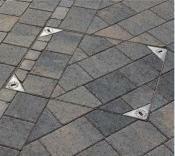 It follows then, that most of the disadvantages associated with paving are caused by poor installation. When you arrange a block paving quote with one of our paving installation companies you should try to view some examples of their work before you decide. Wide range of colours, textures, sizes and shapes of block paving. More attractive than plain concrete or tarmac. 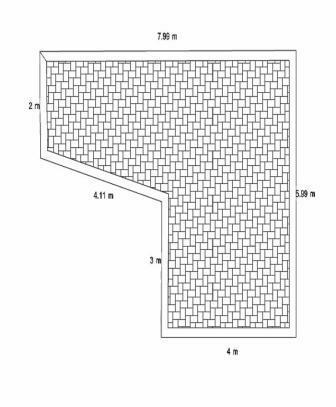 A wide choice of designs and layout patterns are available with block paving. If an individual block, or several of them, are damaged or stained they can be replaced easily. Because block paving is manufactured in controlled conditions the blocks tend to be uniformly sized and coloured. Not being a solid product, like pattern imprinted concrete, moss and weeds can develop in the joints between the blocks. Cutting corners with the sub-base can cause a block paving driveway to sink under the weight of cars. Block paving can fade due to effects of sunlight over time. A white powder known as efflorescence can form on the surface of the blocks and although it will disappear in time, most householders consider it to be unsightly. Modern housing developments tend to squeeze more homes on to available building land than ever before which has resulted in smaller driveways. 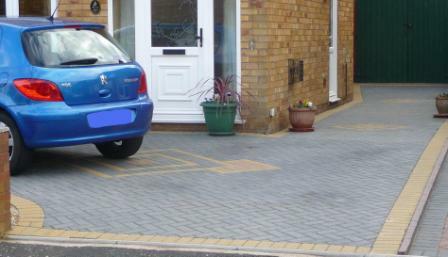 Consequently an increasing number of householders are paving over their front gardens to provide extra car parking spaces. This results in less surface rainwater being absorbed into gardens and more water running off on to the highway and being fed into drainage systems. 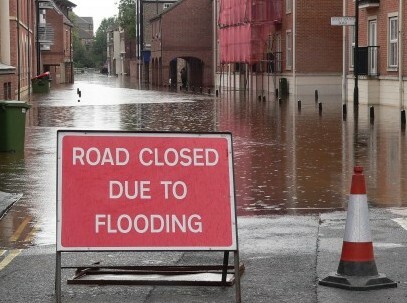 When drainage systems can’t cope with this extra volume of water, localised flooding occurs. As a result, the Government introduced SUDS (Sustainable Urban Drainage Systems) legislation which requires that all paving installations have drainage systems installed to deal with surface water within the boundary of the property. 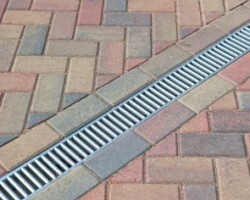 If your driveway slopes towards the pavement or road, you should install aco drainage at the entrance to the driveway which takes surface water to a soakaway. 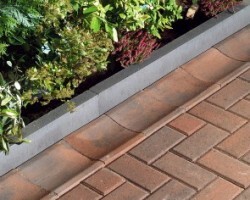 Blocks used in Permeable Block Paving have nibs formed around the side of the blocks so that when they are laid next to each other, the joints between them are slightly wider than would otherwise be. Additionally, for a permeable block paving installation to be effective, the sub-base needs to be porous whilst still able to support the weight of cars on its surface. 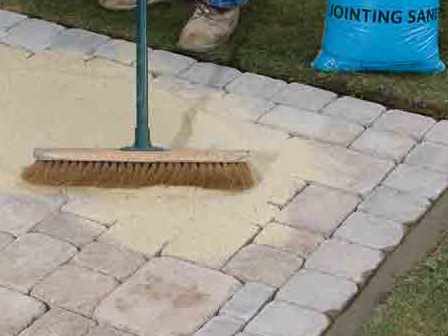 The limestone sub-base for permeable block paving contains more stone and less ‘fines’, which as the name suggests is finely ground limestone dust.